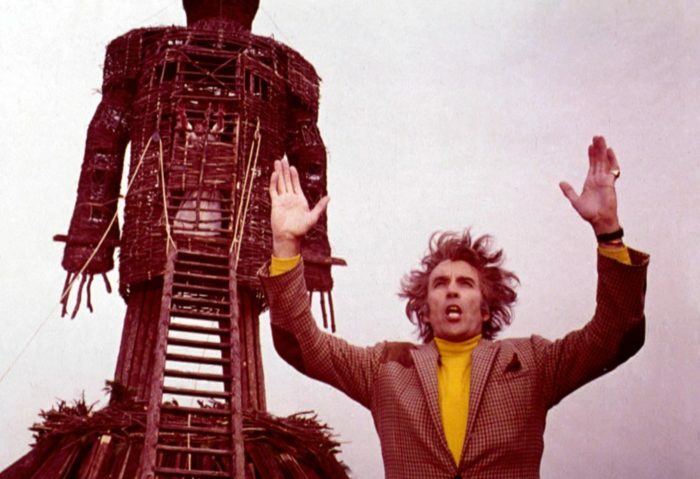 The Wicker Man is a film that for years I’d only known a few stray things about, despite its status as a horror classic. Namely, the ending, which is a bit unfortunate, since other than it being the reason for the film’s title and being hinted at a few times earlier in the film, it comes as quite a surprise. Meanwhile, the only other frame of reference I had was the (supposedly) terrible Nicholas Cage remake, which apparently features a scene of Cage getting bee-ed, which isn’t even in the original. So it was nice to see that The Wicker Man is my kind of horror/thriller – one that doesn’t seem to have much in the way of onscreen violence, and yet the societal parallels it delves into are surprisingly visceral. 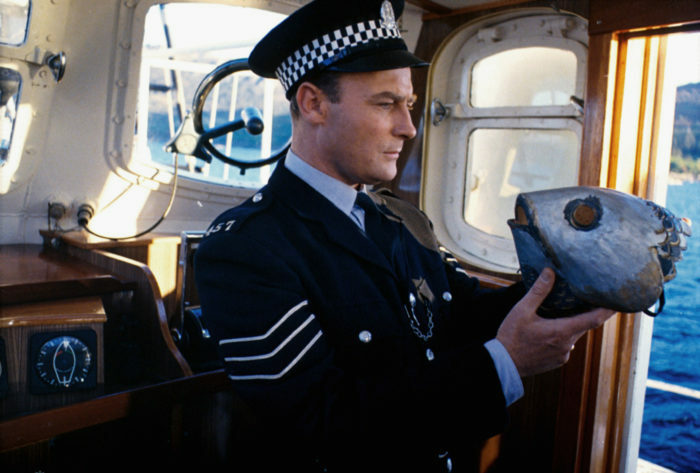 The film opens on a seaplane landing just off a Scottish island called Summerisle, where the police Seargent Neil Howie (played by veteran UK TV actor Edward Woodward) appears to be looking for a missing child. As Howie starts asking around town about Rowan Morrison (the missing girl), he seems to find that people either have no recollection of the girl or of what happened to her. So he keeps getting to know the town’s inhabitants better, as if that will finally lead him in the right direction of this seemingly endless rabbit hole. Along the way, he finds that this village prescribes to the Pagan religion, which he finds out by the sight of naked people out and about doing rituals that are foreign to the devoutly Christian Howie. This ultimately leads him to the charismatic Lord Summerisle (Christopher Lee), who is more or less the leader of the island. He explains that his family has long overseen the vital harvesting of fruit on the island, which often involves human sacrifice – as is Pagan tradition – when the harvest is weak. This then leads Howie to believe that this may be the source of Rowan’s disappearance. One thing I wasn’t expecting from this movie (or any horror movie, really) was how musical it is. The opening sequence of the film is set to a modest British folk ballad, and gives the film this air of unearned breeziness, though we soon come to see that something much more sinister is lurking underneath. We also get this almost surreal introduction to the character Willow (Britte Eklund), who seeks to seduce the virginal Howie by dancing naked in the room next door. Then we also get a jaunty/creepy scene of this adult instructor dancing and singing with kids around a maypole. All of it may seem out of place at first, but just adds to the idea that this place seems idyllic and carefree, yet also has its share of dark secrets. Of course, you could say that there’s nothing wrong with the islanders’ Pagan lifestyle, filled with dancing and singing and nakedness. Well, other than the human sacrifice stuff. Similarly, you could say that the hippies of this time period weren’t causing any harm by engaging in dancing and singing and nakedness. Yet, you’ve got squares like Sgt. Howie walking around, clinging to their Christian Orthodox values, who ultimately end up being swallowed by the madness of this world that they don’t understand. I can’t find much quoting director Robin Hardy or writer Peter Schaffer intending to use this real life parallel in the context of the film, but it’s hard not to make. Speaking of Robin Hardy, he didn’t seem to go onto much else after The Wicker Man, considering he would only direct two other features after this debut film of his (one of them being a 2011 Wicker Man sequel). It seems like kind of a weird anomaly in the horror genre for one of its finest features to come from a non-auteur. But maybe chock that up to it being a bit out of step with the trash and brashness of American fright flicks at the time to give him enough success for a suitable follow-up. But at least for this one film, he was on a shining hill, staring perfection in the face.